The area that encompasses Letchworth State Park was not always as we know it today. It evolved largely through the efforts of one man, William Pryor Letchworth, who in the 1800s, purchased part what would become the park and preserved it for future generations. Castile Historical Society President Ron Ballinger has been collecting information and old photographs on the history of the area and is regarded as an expert. The land, Ballinger said, once belonged to the Seneca Native Americans, and by the 1800s, turned into primarily farmland. Another feature was a canal, which was built from 1837 to 1852. It ran from Rochester to the Allegany River, allowing people to take boats from Rochester to the Allegany, then the Mississippi, and eventually to New Orleans. The canal was located on the East side of the gorge alongside the current train trestle, but closed in 1878. The property was then sold to the railroad. The view of the gorge was dominated by the original trestle, which was a wooden bridge built in 1852; it was the first of three and had a pedestrian walking deck. The bridge burned down in 1875 and a new metal bridge was built. That lasted until the 2000s, when the current train trestle was built, still incorporating the original bridge foundations from the 1800s. William Pryor Letchworth came on the scene in the mid-1800s when he visited the gorge and its falls. Letchworth was a successful businessman, who lived in Buffalo. He was also a Quaker, which gave him a viewpoint of doing social good to benefit society. His religion influenced much of what he would later do in the creation of the park. 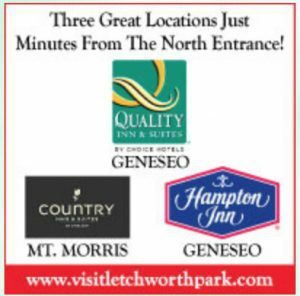 In 1859, Letchworth purchased the house that would become the Glen Iris Inn. He eventually bought other tracts of land, as well. The Glen Iris was Letchworth’s home and office. He added a third story onto the home and later built other structures in the park, including cottages he modeled after houses he studied in Switzerland. An example of Letchworth’s social good is the Prospect House, which is now one of the rental houses for park visitors. He used the house for kids who traveled from Buffalo in order to enjoy the outdoors and see the country. Children at Prospect were cared for and supervised by Catholic nuns. Letchworth started a large collection of Native artifacts and created an Indian museum; many of the artifacts are currently at the park museum. He had the buildings at the Council grounds brought on site, piece by piece, from other locations. Letchworth also felt that the remains of the “White Woman of the Genesee” — Mary Jemison — should be in the park, as it is where she lived much of her life. In 1874, he had her remains reinterred on the grounds, and eventually had a statue made, insisting that the model for it be a young girl of Irish descent, as Mary Jemison was before she was brought into her tribe. Letchworth died as the result of a stroke in 1903. He left a deed that turned the land over to New York State in 1907. The state has since developed it into a 14,350-acre park that has been voted the best state park in the United States, and is visited by people from all over the world. Much of the park we see today is from the 1930s Civilian Conservation Corps work forces, which gave young people work and job skills during the depression. These included the stone walls, bridges, stone picnic tables and facilities throughout the park today.